1. 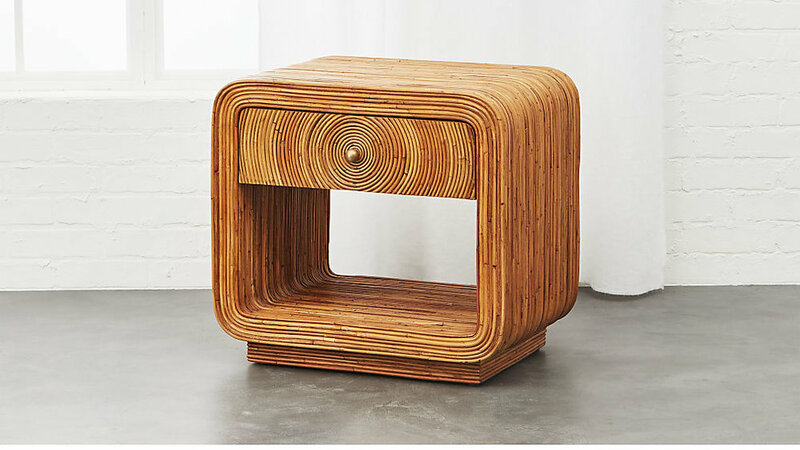 We just recently spotted this ridiculously cute rattan nightstand can't wait to use it on a project! 2. Nordstrom's Anniversary Sale is currently in full swing! We are stocking up on cute summer shoes, we love these in blush, you know we're always fans of a stripe and how fun is the knotted detail on these? 3. For a limited time only...Williams Sonoma Home is currently offering an extra 30% off sale items! We're all about a greek key and recently purchased this for a client and love it! 4. We've had tons of questions about this beautiful light blue grasscloth wallpaper by Phillip Jeffries and it's actually on SUPER sale...over half off! 5. We have heard nothing but amazing reviews for La Mer products we've been waiting to try...good news is that this set is currently on sale which gives us the perfect excuse to add to our cart! 6. With all of this summer heat, we've been loving this cream shadow that stays on and stays true all day long...definitely a new favorite! 7. Serena & Lily is currently having a massive tag sale! It's the perfect time to add our "go-to" favorites to your cart like this, and this and this and this! 8. How fun are these round mirrored Burberry sunglasses... an updated take on classic tortoise frames! 9. We're always on the hunt for a great counter stool and love that you can easily customize the cushion on this (plus...it's on super sale!) How cute would it be reupholstered in a fabric like this, this or this? 10. It's a great time to pull the trigger on that outdoor furniture you've been eyeing...so many great items on sale...like these!